A custom procedure pack delivers a specific set of medical products in a single sterile tray format to hospitals or surgeons in order to perform a specific surgery. In terms of revenue, the global custom procedure packs market was valued at above US$ 10,000 Mn in 2018 and is anticipated to reach approximately US$ 15,000 Mn in 2027, expanding at a CAGR of 4.6% from 2019 to 2027. Rise in the number of surgical procedures and high demand for minimally invasive surgeries are key factors that are anticipated to propel the custom procedure packs market during the forecast period. Rising globalization leads to the outbreak of several diseases, and some of them require surgery. According to the Annual Plastic Surgery Report by the American Society of Plastic Surgeons, there were almost 15.9 million surgical and minimally-invasive cosmetic procedures performed in the U.S, in 2015, a 2% increase over 2014. This increasing number of surgeries is fueling the demand for custom procedure packs. A large number of global manufacturers are adopting different promotional strategies, such as developing different custom website, through which hospitals or surgeons can design and order their own custom procedure packs as per their requirements and perform surgical procedures more effectively and smoothly. Such strategies not only save time for procedure but also help hospitals and other surgical centers avoid unnecessary stocking of devices in their repositories. These key developments are likely to augment the global custom procedure packs market in the near future. However, faulty devices that are available in the procedure packs are likely to restrain the global custom procedure packs during the forecast period. 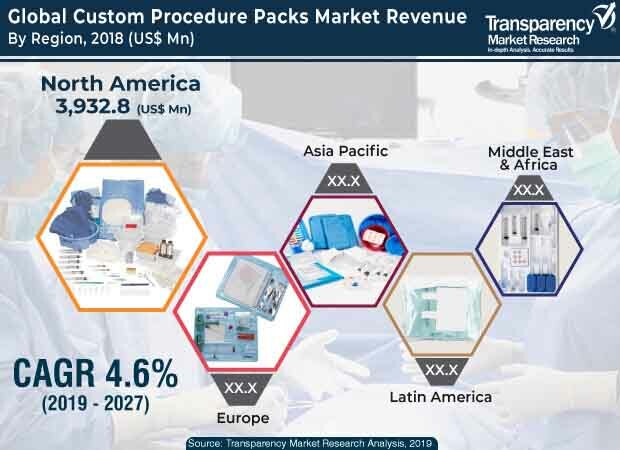 In terms of region, North America held a major share of the global custom procedure packs market in 2018. Robust healthcare infrastructure and a rise in the number of surgeries are propelling the market in North America. In terms of revenue, the market in Europe is projected to expand at a rapid pace during the forecast period, due to a rise in the number of surgeries in a significantly large geriatric population. Rise in hospitals, accidental cases, and awareness about the benefits of custom procedure packs in surgery in countries such as Saudi Arabia and Qatar, and increase in government investment in the healthcare system in countries such as Colombia, Mexico, and South Africa are likely to boost the market in Latin America and Middle East & Africa. Key companies operating in the global custom procedure packs market that are profiled in the report include Medline Industries, Inc, Mölnlycke Health Care AB, Owens & Minor, Inc. Cardinal Health, B. Braun Melsungen AG, Unisurge, 3M, Thermo Fisher Scientific, Inc., and PrionTex. Custom procedure packs contain a specific set of reusable or disposable medical devices that help save time and increase the efforts of surgery. The global custom procedure packs market is expanding at a significant pace due to a rise in the number of surgeries and increase in launch of innovative tools for customer support in order to design their own packs as per their needs. The global custom procedure packs market report comprises an elaborate executive summary, which includes a snapshot that provides information about various segments of the market. It also provides information and data analysis of the global market with respect to the segments based on use, product, end-user, and region. A detailed qualitative analysis of drivers, restraints, and opportunities has been provided in the market overview section. Additionally, the section comprises a competitive matrix and company profiles to understand the competitive landscape in the market. This section of the report also provides market attractiveness analysis by geography and market share analysis by key players, thereby presenting a thorough analysis of the overall competitive scenario in the global custom procedure packs market. In terms of region, the global custom procedure packs market has been segmented into five major regions and key countries/sub-regions in the respective region: North America (the U.S. and Canada), Europe (the U.K., Germany, France, Italy, Spain, and Rest of Europe), Asia Pacific (China, Japan, India, Australia & New Zealand, and Rest of Asia Pacific), Latin America (Brazil, Mexico and Rest of Latin America), and Middle East & Africa (GCC Countries, South Africa, and Rest of Middle East & Africa). The market size and forecast for each of these regions and the mentioned countries have been provided for the period from 2017 to 2027, along with their respective CAGRs for the period from 2019 to 2027, considering 2018 as the base year. The research study also provides the competitive scenario in these regions. The report also profiles major players in the market in terms of various attributes such as company overview, financial overview, devices portfolios, business strategies, and recent developments. Major companies profiled in the global custom procedure packs market include Medline Industries, Inc, Mölnlycke Health Care AB, Owens & Minor, Inc. Cardinal Health, B. Braun Melsungen AG, Unisurge, 3M, Thermo Fisher Scientific, Inc., and PrionTex.